Full Color Note Pads and Desk Pads are some of the very best promotional tools you can give your customer, because they are genuinely useful and keep your name and contact details right in front of them. 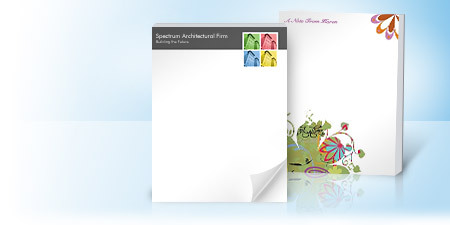 At Albert’s Printing NY, We provide promotional note pads & note books from sizes A2 through A7. We stock many shapes and can make promotional notepads to almost any custom design you require. Many clients like to personalize their promotional note pads, notebooks and custom post-it notes by adding both text and company logo. Anyone who comes in contact with these superb little billboards will instantly recognize your company logo and brand. Promotional notepads and custom post-it notes are essential tools which help you keep track of your day-to-day business.